Here's a unique promotional option that can drum up some new attention for your business! This is the transparent version of our electric lighters. You can personalise it with your logo or slogan and add them to your goodie bags. 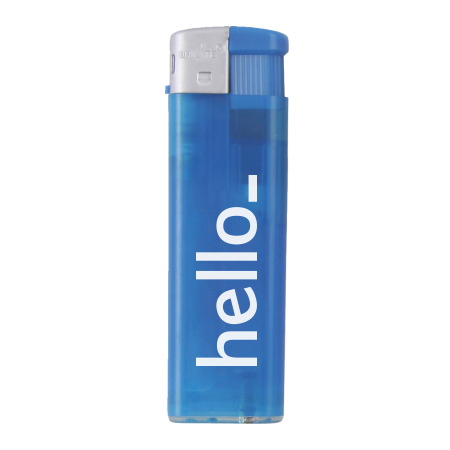 Helloprint's Lighters help promote your event! Are the lighters sufficient according to the requirements regarding to child safety? 1 What colour lighter do you want? For the delivery of your transparant lighters: electric we use multiple carriers. Because of the highest reliability, in most cases we use UPS or DPD. The transparant lighters: electric that is chosen in most cases can be selected via our website. In 2016 the Europe cal commitee took the descision to implement safety measures to prevent children accidents with lighters. All lighters have to meet the requirements of the Europe cal momission as specified in EN13869. All lighters within the Helloprint product range are produced according to the Europe cal committee. Why should I choose the number of colours? The lighters are printed with the pad printing technique. It is only possible to print per colour with this printing technique. After printing one colour the printer has to be set over again to print the second colour. This is why the price is changing when if you want to print the lighters with more colours. How should I formalize the file for a lighter? The colors used are known as Pantone colors. Pantone is a standardized color scheme and is used worldwide. It is, therefore, important to deliver your logo in Pantone colors so that we can start directly with the printing of the lighters. If the logo consists of Pantone colors, it must be stored as a vector. Vector is to say that the image does not consist pixels, but is build up out of lines.